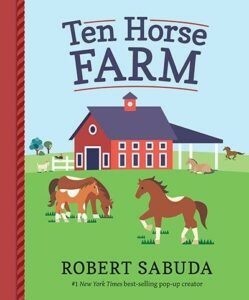 When you see a book with Robert Sabuda's name on it, you know you are in for a ground-breaking, brilliant adventure that will have some children asking, "How do they do that?" and some children simply laughing with joy at the fun and wonder of the art and the magic of the creative inventiveness on each page. This is one of those masterpieces. Verbs come alive on each spread as each glorious horse expands into the page as we complete the full page turn. What was once waiting for us is now racing a hound to the next page. We are truly off and running. It's followed by the opposite, resting, and the warmth of friendship and fun as a trio of cats comes to climb and enjoy the sublime experience of horse sliding. There is a grand sense of fun, of play, of friendship, of quiet, of energy and above all of getting along with each other and working as a team. Find all ten horses on the last two pages...it's a seek and find finale. Joy, laughter, and genius leap off every page. A perfect spring (or any time of the year) read aloud for any young listener. Roan, speckled, dappled, gray — how many different horses are playing on these pages? A new novelty delight from renowned pop-up master Robert Sabuda.